Weight Loss Tip : Stand up! Amazing as this may sound, one of the major weight loss impact throughout my journey this year, has been the fact that I’m standing up a lot more than I used to. Before I had my slipped disc re-injury, I was sitting down a lot and that included slouching my shoulders. This is my current setup at home with my 15″ laptop. A lot of people had something to say about it. Like it’s too high or too far away from my eyes that I have to squint. I actually don’t have to squint at all since I always did make sure that my specs were always the correct prescription. So it’s not so bad. 🙂 At the same time, my eyes got the necessary rest away from the monitor so that helps too. Since I started standing up when using the laptop, my body has become smaller. It takes a lot more energy to stand up for 2 hours than it is to sit down for 2 hours. Plus, it helps my back by putting less pressure on the herniated disc that I can now stand for long hours with no problems. Of course, proper shoes also helps a lot. 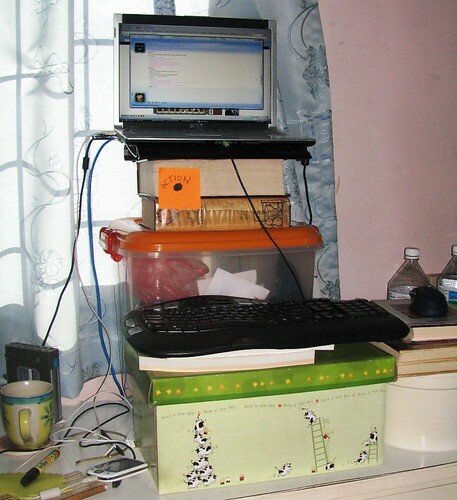 I have a similar setup at the office where my standing workstation helps to reduce the pressure on the spine, especially the discs pressure. It’s interesting to be working while standing and I do get a lot of feedback from people. But ergonomically, it is definitely more friendly than sitting down for 8 hours. And trust me, I became smaller. 🙂 That was definitely a plus. wow! this is smth new! Will try it out too 😀 Thanks for the tips! Oh yes, very but provided that you’re wearing flats and not heels. LOL! If you wear heels, it’s going to hurt in the long run.